LAWRENCE – For generations, flamenco has captured the world’s imagination, but rarely the attention of American scholars. A recently released book, “Flamenco on the Global Stage: Historical, Critical and Theoretical Perspective," challenges long-held beliefs about the traditional Spanish dance and connects it to diverse areas of research, such as jazz, post-colonialism, gender and sexual identity. The book, among the few scholarly works to be printed in English about flamenco, includes translations from Spanish and French. Contributing articles are dancers, guitarists, historians, cultural theorists and flamenco aficionados. “We make assumptions about eras within flamenco history, and there is not a lot of evidence to support those assumptions. This book debunks some of those myths and fills in the empty slots,” said Michelle Heffner Hayes, professor and chair of the University of Kansas dance department and co-editor of the book. Hayes co-edited the book with K. Meira Goldberg, an instructor at the Fashion Institute of Technology, and Ninotchka Devorah Bennahum, a professor of dance history, theory and performance study at the University of California, Santa Barbara. Fascination with the exotic Spanish dancer dates back to the 1500s and can be found in records of the Inquisition, European travel diaries and literature. But the specific art form of flamenco didn’t emerge until the mid-1800s. Flamenco drew from the traditions of southern Spain, but Hayes said it wasn’t insulated from outside influences. Among them was the interplay between artists at the World’s Fairs at the height of post-colonialism, when exotic cultures sparked Europeans’ imaginations. “What hasn’t been discussed until now is how all these artists playing on the fairway at the World’s Fair are talking to each other, performing for each other and influencing each other,” Hayes said. That flamenco embraced outside cultures and didn’t emerge as a fully formed art form is among the common misconceptions the scholars address in the book. Other articles examine the contribution of African-American dance styles on flamenco in the early 20th century and a dance academy in the 20th century that standardized the dance form that many believed had been handed down from generation to generation. Articles also explore the lives of great flamenco performers, some which ended tragically. As the authors note, flamenco can provide insight into the history of Spain’s relationship with the United States and Latin America and today’s issues of immigration and the European financial crisis. In February, Hayes will travel to Duke University to conduct an oral history project on flamenco and will present at Encuentro Flamenco 2016: Flamenco and Articulation of Identity, a conference at the University of California, Riverside. 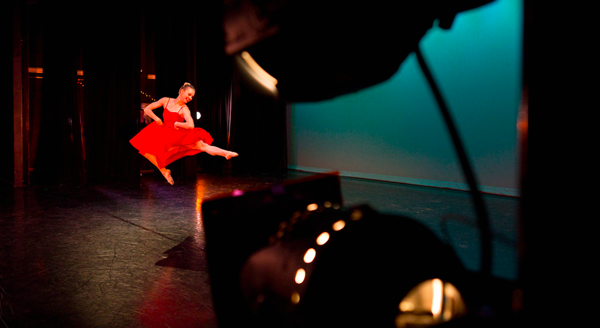 Top photo: One of Professor Michelle Heffner Hayes' student performs on stage. Heffner Hayes' area of specialty is flamenco dance. Photo: Meg Kumin, Marketing Communications. 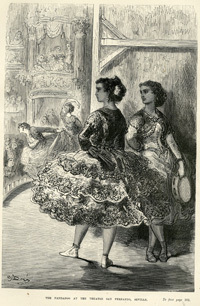 At right: Boleras wait in the wings in this 1862 illustration by Gustave Doré, which appeared in “Spain,” written by Charles Davillier and illustrated by Doré. Submitted photo.